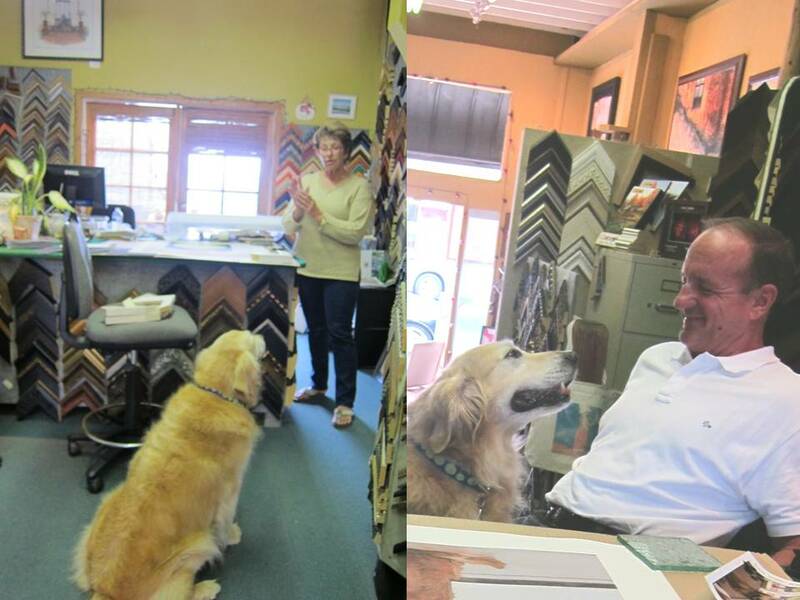 Dad took me to the frame store to get my print for Mom framed. The frame lady opened my box took out the print and laid it out on a table. I told her I wanted a frame for it. She started asking me all these questions like what color frame, what kind of mat, what color mat, how big, and on and on. OMD! I was so confused, so I asked Dad to help answer the questions. He kept answering the lady that he trusts her judgement. Oh. I could have said that! I was so excited to get my package from Lucas. It is a special print for my Mom. But Dad told me we can't open it until we go to the Frame store cause he doesn't want to chance it getting hurt. So now I will just protect it until we go to get a frame. I hope that is tomorrow, cause this box is not very comfy to lay my head on. Mom. 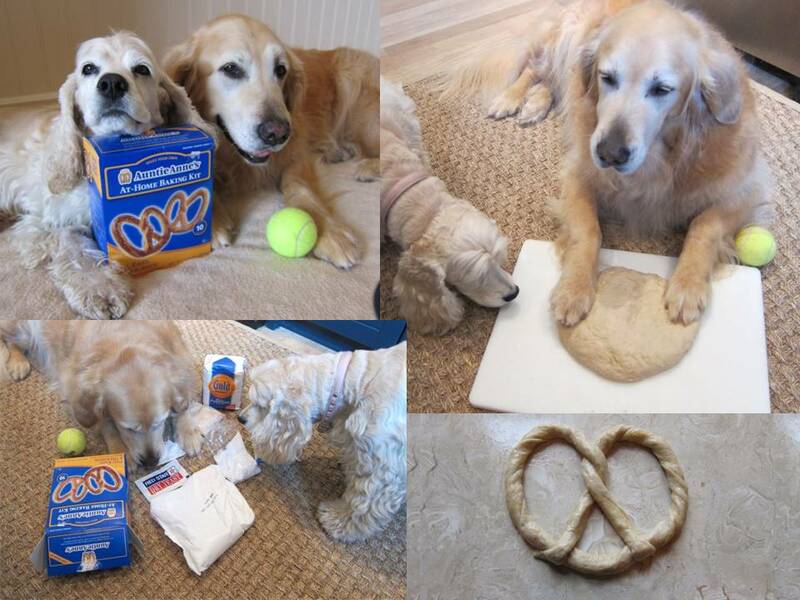 So Mom couldn’t resist her cuteness and she let us make pretzels. I had no idea it was so complicated! First I had to knead the dough under Annie’s supervision. Mom helped us shape it into twists and sticks. I oversaw them baking in the oven. Then we admired and sampled our work. YUM! Today is National Pigs in a Blanket Day. I imagined that we would go to a farm and bring some blankets for the pigs. 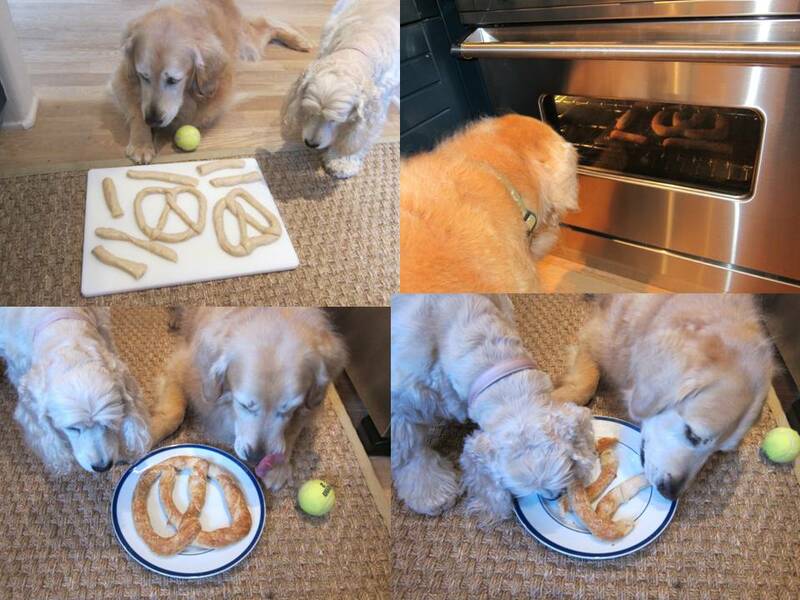 But then Mom pulled out a box from the fridge --little hot dogs in pastry! I am just confused why they are referred to as pigs in a blanket, rather than dogs in a blanket. Weird. Anyway, I highly recommend celebrating this day. 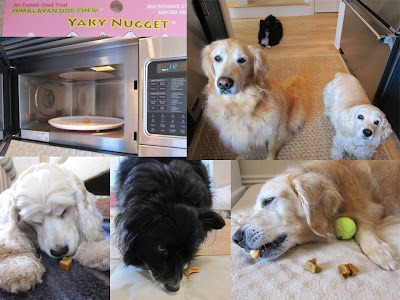 These little hot dog pigs are YUM! . The other day on our beach walk I was so excited to find my ball. 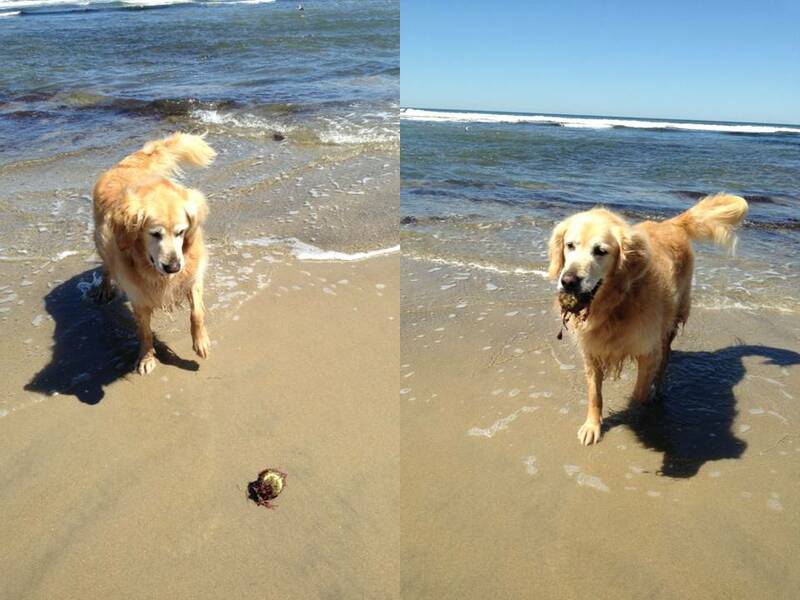 It was a ball from very long ago that got swept away in a large wave. Though I tried hard, I never was able to find it. But there it was covered in all sorts of ocean matter, ready to come home with me. I cant wait to hear all about its adventures at sea. Remember I told you about Annie's antics? Well she did it again! 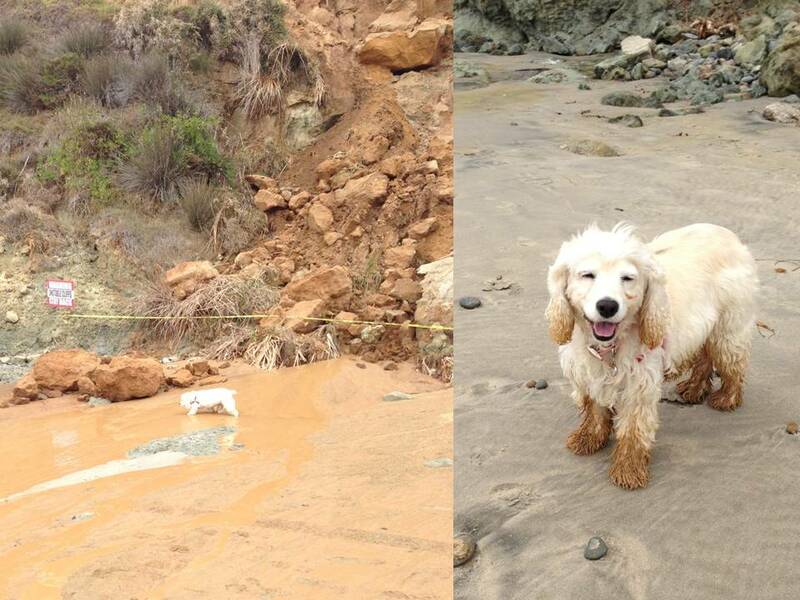 There had been a new mudslide at the beach by the cliffs. There was a sign that specifically said to stay back. So we told Annie to walk with us. But Annie, as usual, likes to explore. So she walked through the fresh mud. She thought it was fun. Rosy thought her ombre look was fashionable. Mom and I just rolled our eyes. Today is National Cheeseball Day. So I asked Mom to get a Cheeseball for us. It looks so yum and it is bacon flavor! But then Rosy had a different concept of the day. She asked Mom to get Mozzarella balls with tomatoes. She felt that was a healthier alternative and what a princess would eat. So Annie and I are in a dilemma. Which do you think we should use to celebrate: Bacon Cheeseball or Mozzarella balls and tomatoes? Today is the final round of the prestigious Masters Golf Tournament. Whomever wins gets a special green jacket. That got me to thinking. What must it be like to win The Masters? 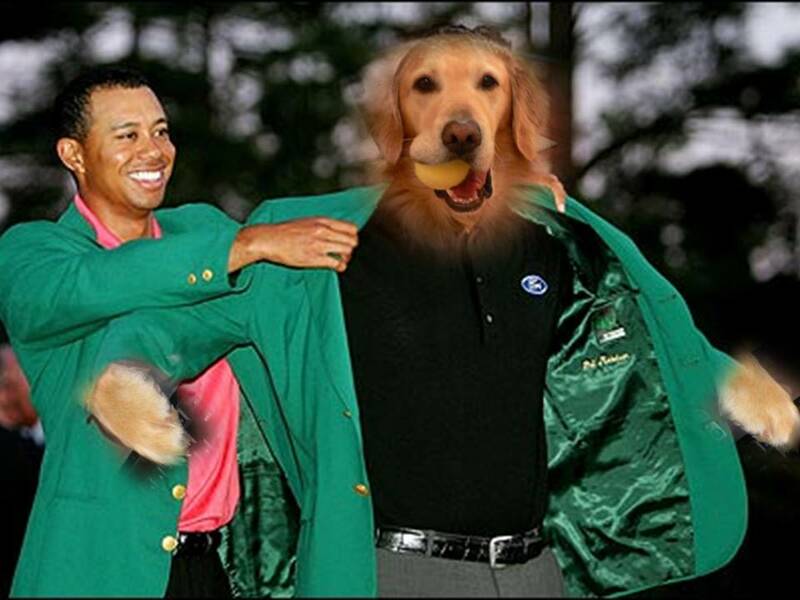 I think I would look good in that green jacket. Well, maybe I should start playing golf. I tried playing golf once with Fuzz and it didn't go so well. But if a Tiger can win, so could a Bear. 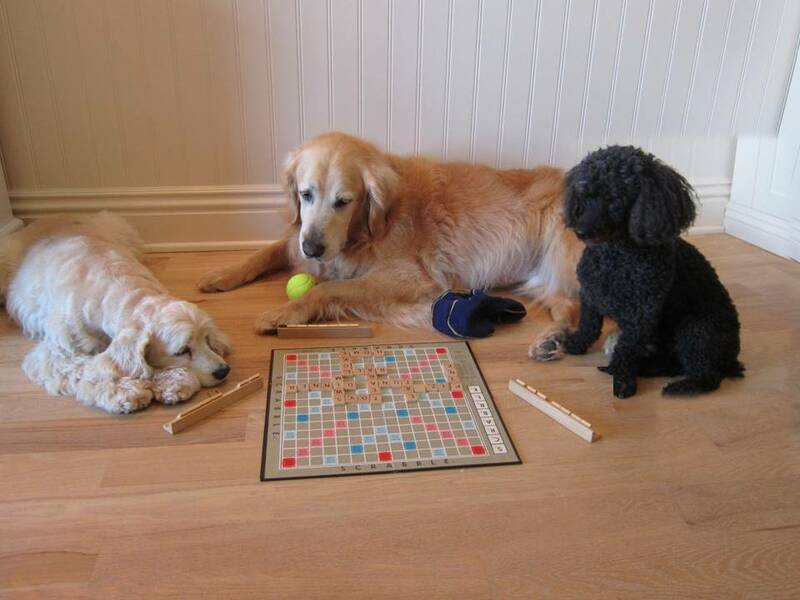 To celebrate National Scrabble Day, we decided to try our paws at the game. Rosy went first and spelled tiara. When it was Annie's turn she took a long time. I had to coach her to help her see if her letters spelled any of favorite words. Can you guess which words were mine? Today is my niece Bunnybell's birthday. Mom got a cake last night since Sydne (Bunnybell's Mom) is couldn’t be here today. But of course before eating cake, Mom had to take pictures. It took a long time cause Annie kept on wanting to eat the cake! 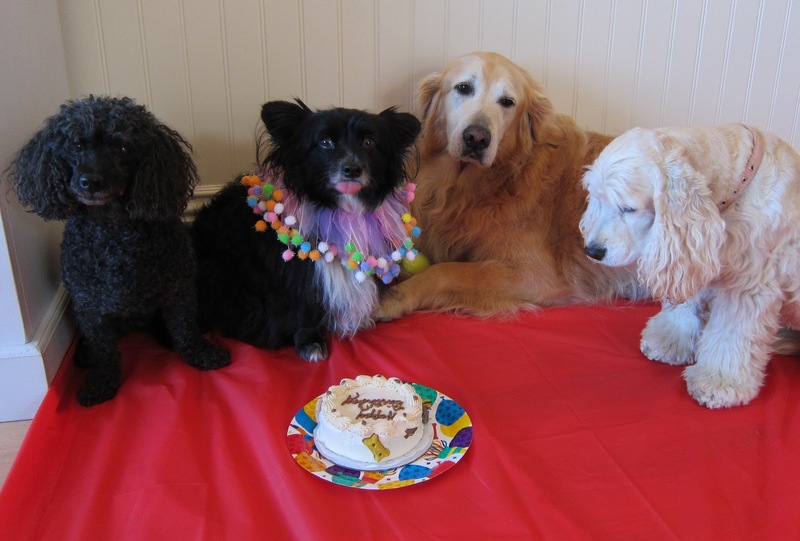 When Bunnybell stuck her tongue out Mom got the hint and we finally got to eat cake. We all got small pieces except for Bunnybell who got half the cake! I guess that's OK since it is her birthday. Today is National Sibling Day. So I would like to recognize my two sisters Rosy and Annie. When you look at us, you may think we don't have much in common. After all, they are little and I am big. Rosy is a princess and Annie is a messpot. But there is a lot that we have in common besides being siblings. 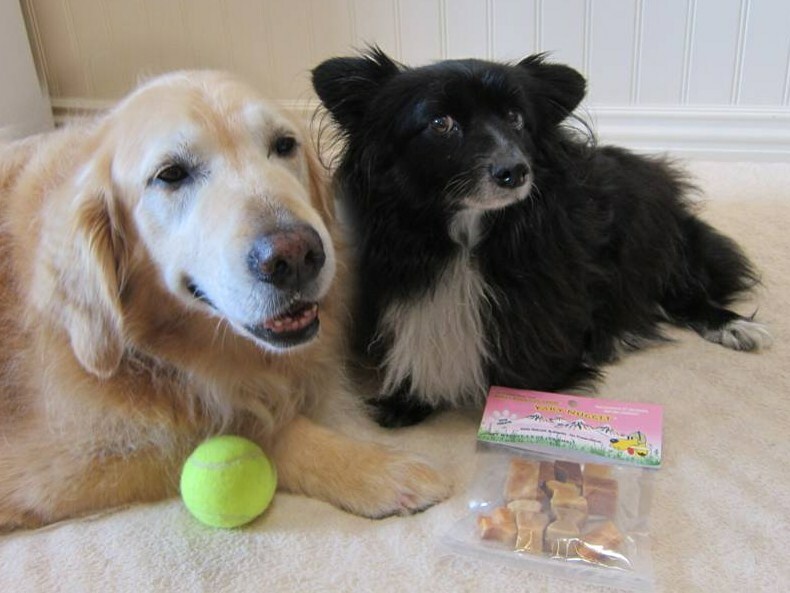 We are all about the same age, we love Mom and Dad, the beach, tennis balls and pizza! I love being their big brother! PS. I also want to recognize my brothers Oliver and Fuzz who went to Rainbow Bridge. I miss them very much. 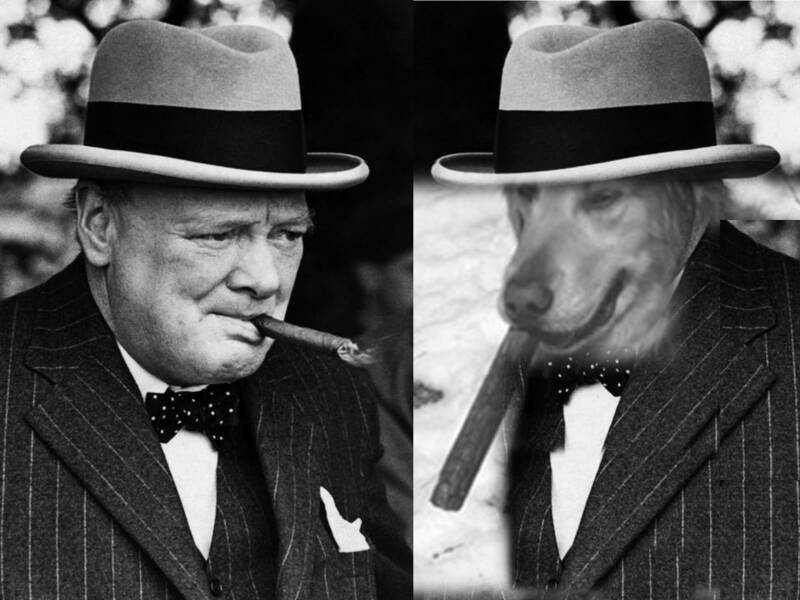 Today we celebrate Winston Churchill Day. On this day in 1963, Sir Winston Churchill was declared an honorary citizen of the United States. This is a special award that can be made either by an Act of Congress, or by Proclamation by the U.S. President, after being authorized by Congress. Wow. He must have been a pretty impressive guy for that to get done! So I am celebrating by learning about him and imagining what it must be like to be such a great man. I would start out by carrying a stick vs. a cigar. It's better for me and gives the same look, don't ya think? First it was March Madness, then the Final Four. Now it is down to two teams for the National NCAA Championship. 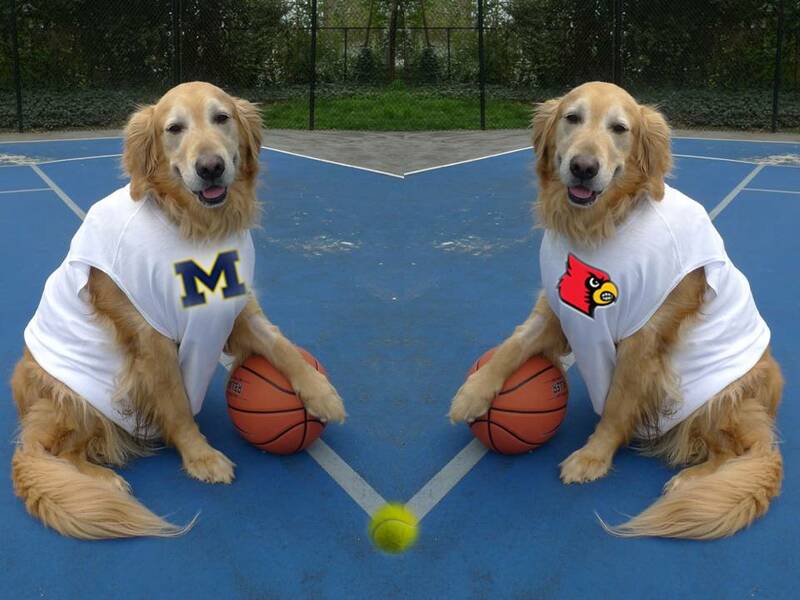 I haven't chosen who to root for. On the one paw, my Dad is rooting for Michigan cause he lived there at one time and I guess he likes Wolverines. On the other paw, Rosy and Annie like birds so they want the Louisville Cardinals to win. Who do you think I should root for? The other day I met a nice Lab named Luna. I asked her to come and play in the ocean with me. She told me she was too busy . I asked her what she was doing. She said since her name was Luna it is her job to dig craters so that the earth looks like the moon. I think parents should really think hard before naming their kids. 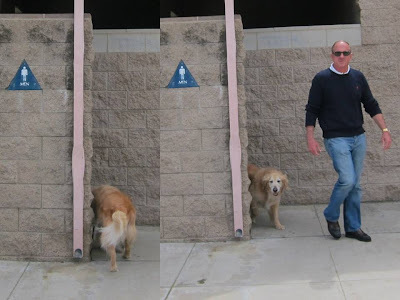 The other day before we went into the dog park, Dad went into an area that said MEN. So I followed him. I was so impressed to see such a civilized place to go to the bathroom in private without girls watching. I looked around though and didnt see any poop bags. I guess they ran out. 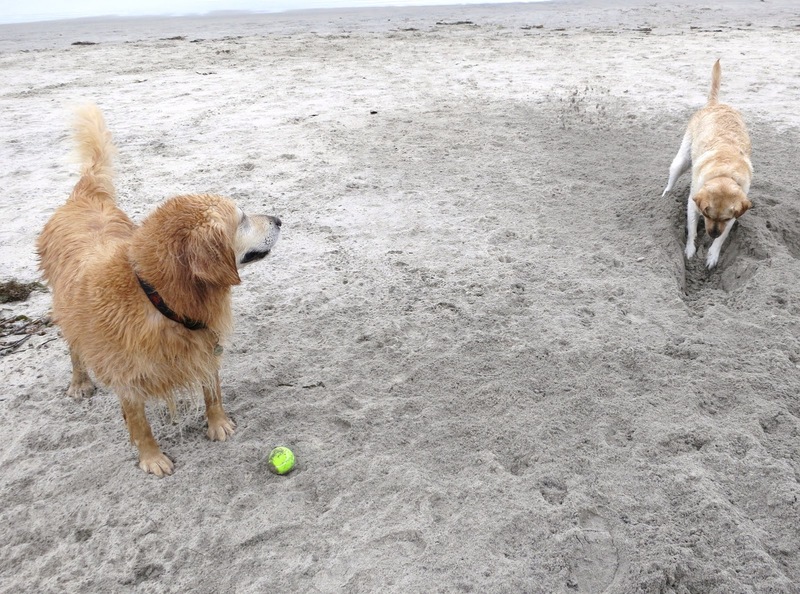 The other day at the beach, Rosy was showing Annie the bird poop because Rosy likes to pee on it. Well Annie thought that it smelled so fragrant that she decided to roll in it. Mom didn't mind so much. She was just happy that Annie didn't roll in the dead bird again. I love when family comes to visit. 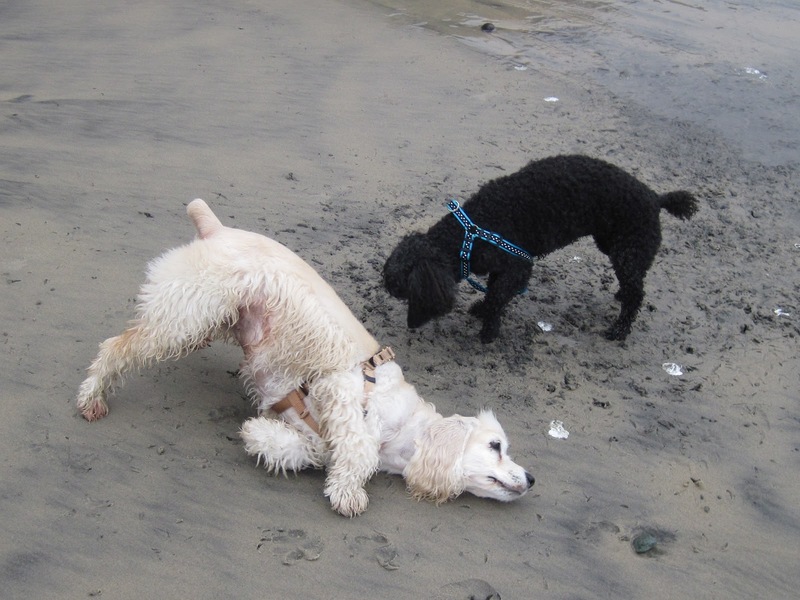 Especially my bro Stephen cause he loves to come to the beach and play with me. However, he plays different than Mom and Dad. They will throw the ball for me when I start barking at them. Stephen doesn't respond to my barking. He just makes a silly face which makes me bark more! When I stop barking he will throw. I guess I don't have him wrapped around my pawfinger.